Before the train ride they have a little cowboy/comic show. Mainly for the kids. We didnt watch it the last time, so we decided to watch it this time. See that "cowboy" there???? He is a dead ringer for a friend of hubby's - a long time friend, that he has known since, well whenever he started in Boy Scouts! He had a trick to make his horse laugh - it was cute! This time we went to the Grand Canyon via First Class - much more comfortable than coach! and you get nibbles going and coming home which was nice. One of the mule trains. I would love - I think - to do the mule ride down the canyon. Although I dont know - with my fear of falling, if I really could do it. Anyway, have to weigh less than 200 lbs so hubby and I cant do it together and I dont think nI would do it alone. I heard that they do the mule train 365 days/year. Have special shoes/bootees for them to wear when the trail is icy -???????? OH HELL NO!!!!! This is the trail that leads down into the Canyon. I forget how long they say to get down 3 - 4 hours? And double or triple that to get back up. The walk around the rim that we did doesnt really get near the edge. But some of the other places you can stop and look do. The 'joke' that hubby kept making over and over last time was about me falling over (as you all know, I am as graceful as a.......) and my joke back was that he wouldnt let it happen cause I was carrying the backpack with the money and the car keys....which I carried this time too! Anyway, they have a book about all the fatalities at the park...I was tempted to get it but it is pretty big with fine print....forgot to check and make sure my name wasnt in there! We saw antelope several times. This was one of two antelopes that were jsut racing each other across the fields....hard to get a great photo cause it was on the other side of the train and they are FAST!!!!!! The perks of the observation car on the way back is your choice of champagne or sparkling cider! Can you guess which one I chose? And it was a California sparkling wine.....and the car wasnt packed so we got several refills! And it wasnt just a taste either - she filled those glasses up! Forgot to add the photo of lunch. After hubby finished playing golf, we stopped by the same bakery - for the same lunch. Only we saved 1/2 our sandwiches (they are so big that the day before we ended up snacking on crackers, cheese, and salami for dinner!) and packed them in with us on the train. 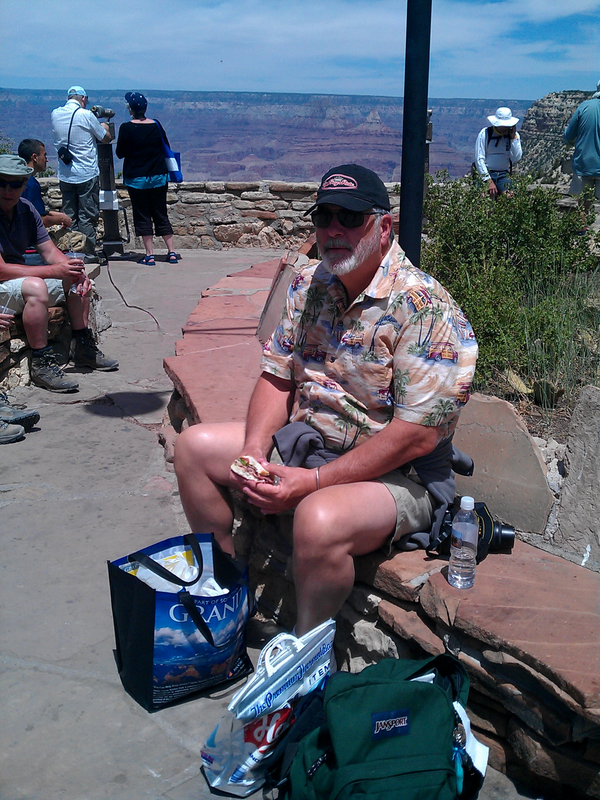 Am very glad we did - not only were they good - but the lines were really long at all the snack places in the Canyon - and the prices were crazy!